We are all works in progress. And this eating thing, well—it’s a work in progress too. The key word here is progress. Recognizing and celebrating our victories, however small, is essential to marking our progress and finding encouragement on our path. The other night I had just come home from a nice meal out. I was full, but I like to end my meals with a little something sweet. 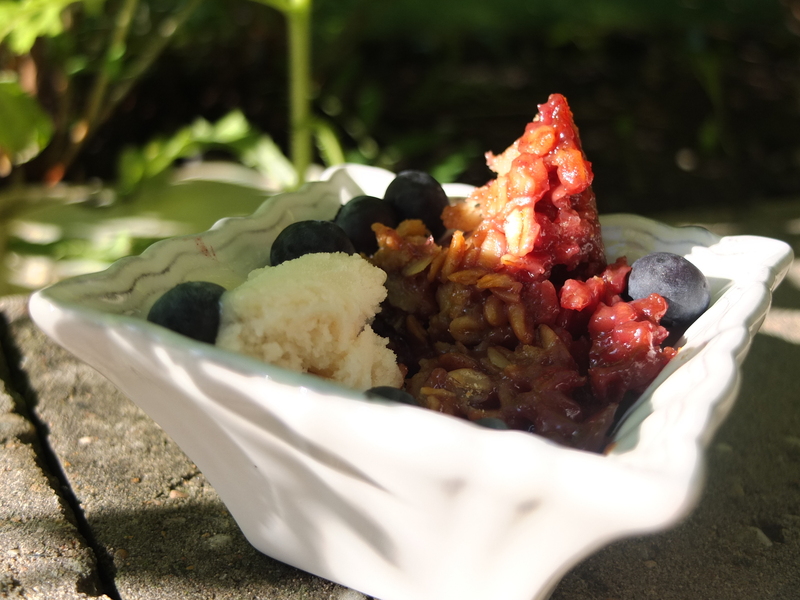 So I enjoyed a spoonful or two of the below rhubarb blueberry crumble. I put it back in the fridge—where it stayed for about five more minutes. And then I went back for another spoonful! I knew I was in an all-too-familiar danger zone. I quickly returned it to the fridge and retreated to the bathroom to get a moment alone. It was here I was able to take a few breaths and check-in with myself to come to the awareness of what was actually driving the behaviour (or the spoon into the crumble, as it were)—I was able to say to myself “holy crap, I’m feeling SUPER anxious right now, and I just need to stay present with myself.” As always, the feeling passed. A victory was had! The lesson is this: even if it doesn’t always feel like it, trust that you are making progress! If you were able to stop yourself mid-binge, or nurture yourself post-binge, or level some awareness at any stage of your experience, that is a victory. So while it may feel like you are “crumbling” or regressing into old patterns because a similar feeling is there, just know that, as the inscription on the Queen Street bridge in Toronto reads, “the river I step in is not the river I stand in.” We are always changing. We are always growing, learning, and trying. It might look like the same behaviour, but you are not the same person engaging with it. What’s been a victory of yours as of late? This crumble was inspired by my Granny’s rhubarb blueberry jam. You might wonder why I bake such yummy things, when doing so makes them available for those moments when the spoon just wants more more more (and we want to numb out)! Well, I guess because I don’t believe in deprivation. And I’m not afraid to throw things out or give them away if I think I’m not going to feel good about eating them in quantities large or small. For the most part, this crumble felt good—and it presented me the opportunity for a victory. Trust yourself—you know what feels good for you. But, if I may say, it is rhubarb season, and in the words of Bob Cratchet, “it comes but once a year, suh! Preheat oven to 350 F. Mix together the above ingredients and place in a baking dish (I use a casserole dish, but you can use an 8×9 cake pan if you like). Mix together your crumble. Chop up the Earth balance into ¼ inch cubes (be sure to do this right before you add it, while it’s still cold). Mix it through the crumble ingredients, then sprinkle over top of the fruit. Bake for about 40 minutes or until you can see the fruit bubble and the topping looks crisp. Serve with your favourite vanilla ice cream. I like what you had to say. Short and sweet. So often we do not celebrate our successes even if we have worked for years to achieve it! I also enjoy the blueberry with the rhubarb, I was looking for something else besides strawberries. Thanks!